La Jolla Shores is Freaking Shark Diving Heaven! Such beautiful sharks. Each one has its own unique pattern and color. 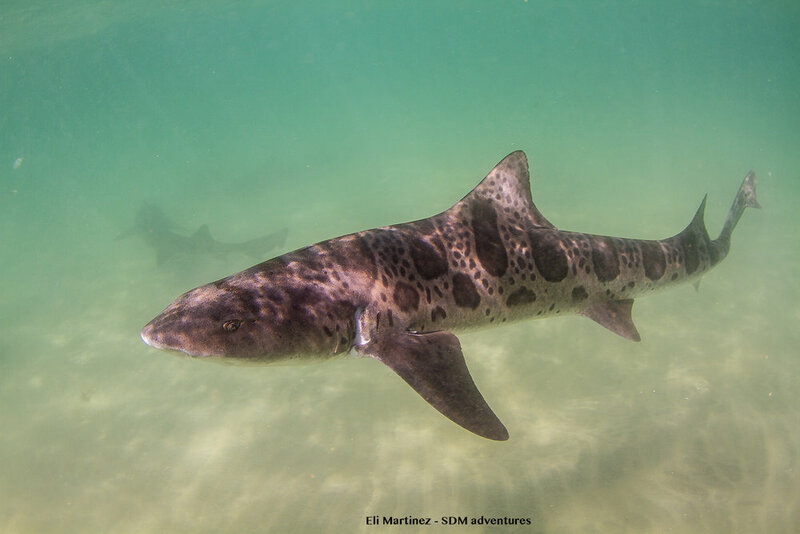 For this dive/snorkel, you literally walk into the surf zone and scattered beneath these waves a few feet away are so many of these beautiful little sharks. As a Shark Diver, it doesn't get any better or cooler than that. After that formal introduction of this place and these sharks, back in 06’ I was hooked. I made it a point to visit this place every year since. The beauty about the shark action off La Jolla is the leopards are not the only great thing about this place, nor are they the only shark species you can find. You can see; topes, horn, swell, angel, grey smooth hounds and the big stars here off La Jolla, the seven gill shark. I have seen them all, except the swell sharks. But everywhere you swim, you are bound to find some species of shark hanging around. The topes here are getting big. The leopards were not the only reason I came out here, I was also after tope sharks. Swimming among the grassy sea beds are where the topes hang out. What a conservation success story these guys are. These sharks were all but gone, until the gill net ban was enforced along the coast lines here off Cali. Now they have seen a rebound in the number of topes. Which is great for the eco-system. Brings back some balance to these waters. Of course, it also adds to the excitement of an already exciting dive site. Like I mentioned I have been coming to this area since 2006 and even though the sharks are always here, the diving easy, its not without its challenges. The ocean is almost always surging which really kills the visibility here. 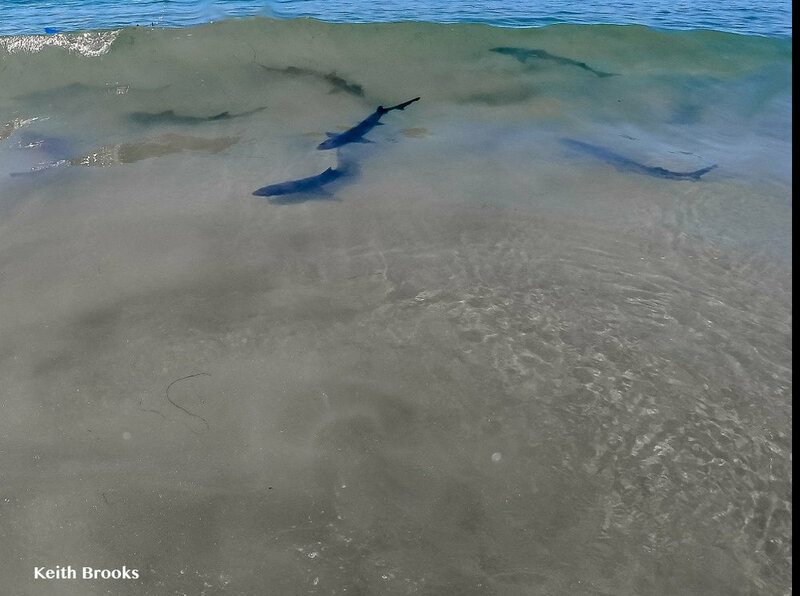 So most of the time I am swimming and trying to capture footage of these beautiful little sharks in muddy soup. Thankfully this was my year to finally have an opportunity to film them in near perfect conditions. It was still surging and the sand was stirred up a bit, but the visibility was amazing. We spent a lot of time playing with the leopards. In two days I think we spent about 5 hours swimming with them. It was just a lot of fun. I do recommend low tide conditions if you want to see them. During high tide, they tend to scatter. Low tide, they seem to gather together, which makes for better shooting opportunities. The topes were a bit more challenging to film, just because they were a bit deeper. On my second day here, I went pretty late in the day for a shot at finding them. Thanks to my buddies, The Scuba Diver Girls, Margo and Stephanie, who literally dive there everyday, finding them was not an issue. They put me on them pretty quickly and I went to work trying to frame shots in failing light. And since I shoot with natural light, it was tough. It was still fun, tracking down and trying to sneak up on these sharks to compase a shot. Well, I did what I could with my time left and started heading back in when the SDG girls found me one more gem…a Pacific black sea turtle. This was a huge goal for me. I rushed over to shoot this beautiful little turtle and like a super model, it patiently stayed there and allowed me to shoot, shot after shot. What a dream. I have a goal of photographing all 8 species of sea turtles, so far I have four. Its actually mine and my daughters Sophie's goal. The plan of course is to film them together. But it is exciting that I found out where to find a black so that I can bring her back later to see them. The black we found is a resident in these waters. La Jolla is such an amazing place with so much to offer a big animal lover like myself. Of course two days is just is not enough time, but I had to say goodbye and continue on my journey. I wrote this blog while packing up my gear and checking out of my hotel for the next stop on this adventure. Today, we are headed South of the border. I am bringing a group of divers to visit Guadalupe Island for a 5 day trip to swim with great whites. Love this crazy Shark Life. Newer PostOur new website...Hell Yea!